No Disney room theme should be without some baby Mickey Mouse pictures on the wall. Colorful Minnie and Mickey Mouse pics will brighten your room and entertain the kids. We have gathered a gallery of inexpensive Mickey Mouse posters and prints for you to consider. 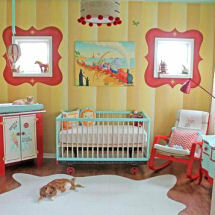 We also will share some tips on where to find free pictures to use as decorations for your children's bedroom wall! BABY MICKEY MOUSE PICTURES, POSTERS and ART WORKS for TWINS! If are the proud parents of twins and need some cool Mickey Mouse wall decor that will work for both a boy and a girl, cartoon pictures of Minnie and Mickey would work nicely in a balanced, gender neutral style of decor! There are so many pictures of Mickey Mouse from all of the Disney movies and cartoons where he was the star of the show! Collectible posters featuring Mickey in his debut film, Steamboat Willie, would be a perfect match for a child's room that's decorated with displays of vintage Disney Memorabilia! If you are lucky enough to have a print of the cartoon strip with Mickey as the conductor of the band you should consult an expert on museum quality framing to preserve it. The "Band Concert" was the very first color Mickey Mouse cartoon so I would say anything from this event would be extremely collectible! If you want to display valuable vintage Mickey Mouse pictures, make certain that they are properly framed to prevent any deterioration of the newsprint. For tips on how to create wall arrangments using baby Mickey Mouse pictures and posters you will want to check out Unique Baby Gear Ideas' gallery to see the Mickey Mouse nursery pictures and take note of the original nursery ideas that our visitors have so generously shared.